Robert Venditti's Green Lantern Vol. 5: Test of Wills is a rare twelve-issue hardcover, collecting issues both from Lantern and also Green Lantern Corps and Red Lanterns. Joining a spate of high-quality fifth Lantern-title volumes, Wills is epic nearly from start to finish; arguably never before have all four Lantern titles been so good all at the same time. This is the second of Venditti's three-act story before the Lantern titles are overhauled after Convergence, and Wills and the "Uprising" crossover are so strong that I'm eager to move forward to "Godhead." At the top, Test of Wills really only has one slow spot in a dozen issues, and that's where Green Lantern Hal Jordan's stuck in a run-of-the-mill gladiator battle to decide ownership of an alien spaceship -- and this issue seems necessary largely to allow Green Lantern to line up with Corps for "Uprising." Otherwise, Wills begins with the shape-shifting Durlans opening salvo against the Corps -- drawn, to underscore its importance, by Dale Eaglesham -- in which a Durlan impersonates Hal and foments intergalactic war against the Corps. Said war is then impressively carried out through the rest of the book by Venditti and artist Billy Tan, and the Corps team Van Jensen and Bernard Chang. Venditti's Green Lantern Vol. 4: Dark Days added an impressive and topical wrinkle to the Lantern mythos, positing the source of Lantern energy in the universe was finite and using it up hastened the universe's destruction. This is a fine environmental metaphor that I find quite interesting, but after ten years already of Geoff Johns building and building the Lantern mythology, Wills is something of a relief, a Green Lantern story that involves the Corps as cosmic superheroes without necessarily some revelation about the fabric of the Corps itself. Venditti effectively builds a house of cards for the Lanterns that quickly falls in on itself, as friend and enemy alike are revealed as ultra-enemy Durlans; I was impressed with how dire the Lanterns' straits become, and again in a story with nothing to do with the Guardians or the Corps make-up. It doesn't seem artist Billy Tan has done much for DC Comics previously, but he is assuredly a "get," and in Test of Wills he proves himself on par with artists like Jim Lee, David Finch, and Jason Fabok -- and indeed, two of those are Justice League artists and DC would be silly not to offer Justice League to Tan should Fabok ever depart. 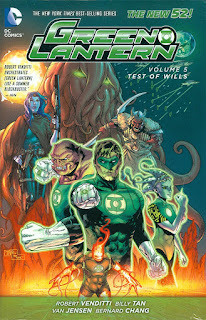 Specifically, Tan's Lantern battles are dynamic here, on par with Ivan Reis and Doug Mahnke, as in "Uprising" part one when the Lanterns protect themselves in collapsing cubes as they're fired on from all sides, or in the fifth part when they must hold the line within a collapsing green dome. In the Corps chapters, in contrast, Bernard Chang's art is often small and personal, and Tan matches that with widescreen space-scapes. Venditti bookends the story with two encounters between Hal and his brother Jim, one when Hal fears he'll never see his brother again after a deal cut with the Red Lanterns for guardianship of Earth, and then again when Hal gets the unexpected gift of a visit. Johns used Hal's family but their presence was somewhat intermittent, and I liked seeing them more here, all toward Venditti demonstrating a certain change in Hal as both a leader and someone more willing to ask for help. Going back to the "finite Lanterns" environmental metaphor, Jim offers to Hal that every living creature consumes and the important thing is just what one does with what they consume. That is perhaps problematic logic when taken to its conclusions, but I appreciate the discussion; again I find this entire slant on the Lantern mythos very engaging. Red Lanterns writer Charles Soule and Venditti work seamlessly together in the two-part "Red Alert" collected here (originally printed as a kind of "flip book") and then DC reprints the entire Lantern/Corps crossover "Uprising." 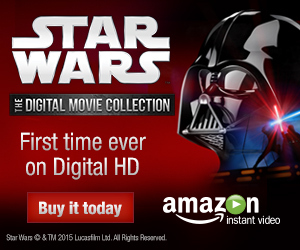 I know there's a lot of double-dipping with this and Green Lantern Corps Vol. 5: Uprising, but I liked not having to flip back and forth between two books. "Uprising" is itself a great crossover on the Corps side, with the return of none other than long-lost Daxamite Lantern Sodam Yat, and I also enjoyed Venditti's theme of turning enemy to ally as Hal makes a truce with enemy leader Nol-Anj (the conclusion of Nol-Anj's story by far makes up for her awkward in medias res introduction in the last volume). For Green Lantern Vol. 5: Test of Wills, "summer blockbuster" is the right word; Wills is a smart space-action story that doesn't require, even, encyclopedic knowledge of the various Corps hues. In it's strong elements of shape-shifting alien paranoia, it's probably not a bad template for Warner Bros's next Green Lantern movie. I'm a major New Gods fan and I'm especially eager to see how and whether Robert Venditti's "Godhead" can fit together with the work Brian Azzarello already did in Wonder Woman; if Test of Wills is any indication, there's good stuff yet to come. You've already got Red Lanterns Vol. 5: Atrocities? Because that was pretty awesome, too. Not yet, what I was going to do was buy a big haul of Green lantern titles (GL 5,6, GLC 4,5,6, etc.) Together and just binge read them since they are really interconnected. That's what I did for the Vol. 5s and thoroughly enjoyed it. You might check out the actual publication orders; I know there's at least one GLC issue toward the beginning of what's collected in Vol. 5: Uprising that takes place specifically before the issue in the same month in Green Lantern; possibly the GL issue also overlaps GLC, but in reading GL I remember wondering "how did [this group of characters] get on [this planet] with the GLs," and then it made sense once I read the GLC story that came before it. Yeah that's what I was most worried about, it looked like GL 4, 5 and GLC 4 ,5 were really interconnected and while reading GL 4 I felt like I was reading the beginning and the end of the story, but missing details in between, which was another reason I wanted to buy them all together. When did Sodam Yat disappear?